One of the big differences between The Division and Destiny is your character in The Division (TD) starts out "classless". In Destiny (D1) your first choice was whether you want to be Titan, Hunter, or Warlock.2 Then as you progressed with your character in D1 you gained talents specific to your D1 class. In TD, your character starts out as an Agent with no unique abilities as it relates to a D1 class/sub-class. So how do you customize your TD character? Once you hit L30 and playing on WT5, you'll be focused on Exotic, normal Gear Set, and Classified Gear Set loot. All other loot will have reduced perks or mod slots, so sell them or dismantle them if you happen to get any. Each piece of gear can be mixed and matched from various Gear Sets. 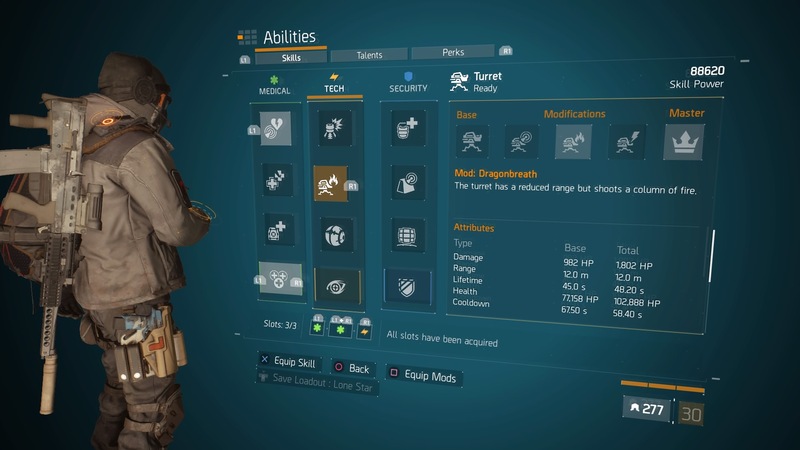 Gear Sets are specialized pieces of gear that give your character additional abilities that are unlocked based on the number and type that is being worn. 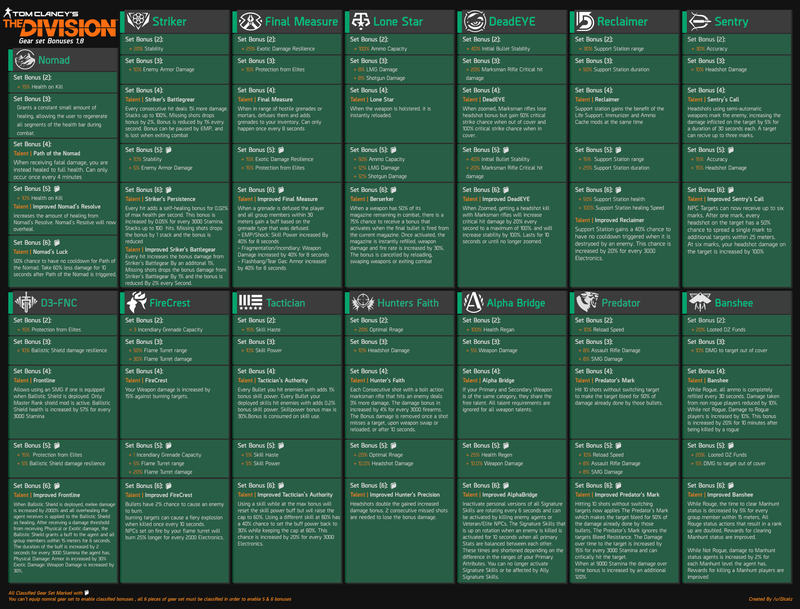 There are currently 14 different types of Gear Sets available in the game. The "class" abilities of your character are unlocked when you equip multiple pieces of gear and trigger the intrinsic perks of a Gear Set. You can see all the Gear Set bonuses here - Reddit Gear Set Bonus List or a PDF Gear Set List. You'll see Gear Sets having stacking perks when wearing 4 pieces of the same Gear Set or 6 pieces of the same Classified Gear Sets. To unlock the 6 piece Gear Set perks, you need to have all 6 pieces be a Classified Gear Set. 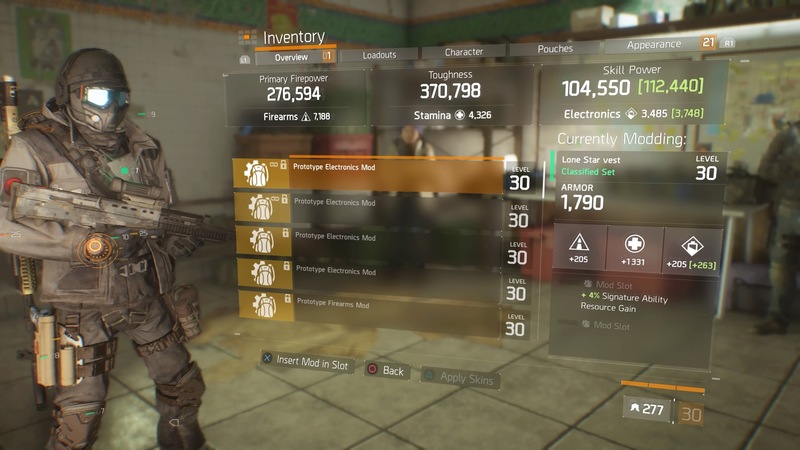 Note: You can mix/match normal and Classified to still get the max 4 piece perk to activate - e.g. 2 pieces of normal Lone Star and 2 pieces of Classified Lone Star will unlock the the 2, 3, and 4 piece perks. Normal Gear sets have a stat point range of 1114 - 1272. 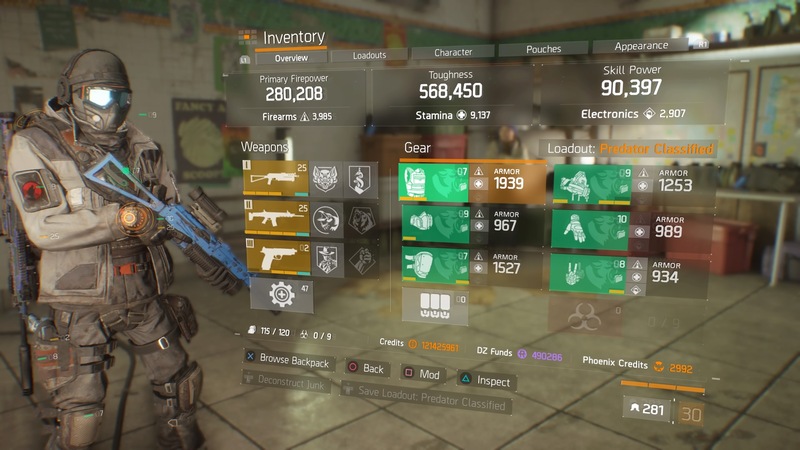 Only Classified Gear Sets can unlock the 5th and 6th piece perks. There is an Exotic backpack, the Ninja Messenger Bag, that has the unique perk of triggering Gear Set perks. If you have one Gear Set piece on, the Ninja Messenger Bag will trigger the 2nd piece perk on that Gear Set. This ramps up to wearing 3 pieces of Gear Set, but activating the 4th piece perk. The Ninja Messenger Bag does not enable Classified Gear Set perks. So even if you don't have a full set of Classified Gear Set, you can get some pretty interesting perks enabled for your character. Stat Mods: Boosts the stat points for Firearms, Stamina, or Electronics. Performance Mods: Enhance the performance of your skills. The number and types of mods that can be applied depends on the piece of gear. Here's each gear piece with the type and number of mods that can be applied. As explained earlier, Stat Mods boost your characters raw stat numbers: Firearms, Stamina, or Electronics. Applying a Stat Mod to your gear will raise a specific Stat 'x' points. In the image above, I'm applying an Electronics Stat Mod to my gear that will add +263 Electronics points to my stats, which equates to 7,890 Skill Power (SP) points. You will apply Stat Mods to raise a certain stat to unlock Gear Set perks (e.g. 9000 stamina for 6 piece Predator) or unlock weapons perks (more on that in Part 3). Stat mods have a range of 228-267 points for WT5/L34 mods, so dismantle/sell anything below 260 points. Stat Mods normally have another perk that gets applied when the mod is applied to a piece of gear. This mod affects your resilience to damage or adds a buff to your stat numbers. If you have multiple mods with the same perk, e.g. 2 mods that both have Skill Haste, those will stack and reduce you skill regen time by the sum of the percentages. I applied the Performance mod onto a piece of my equipped gear. Now after applying that mod to one of my pieces of gear, I can see the Lifetime/Duration3 of my turret went up 7%.4 Note none of the other stats were affected by the mod. There are other mods that could have affected my turret's health or damage output. Like Stat Mods, Performance Mods can stack. So if you applied 2 mods for Turret Damage, the overall effect would be the sum of the 2 mod percentages. 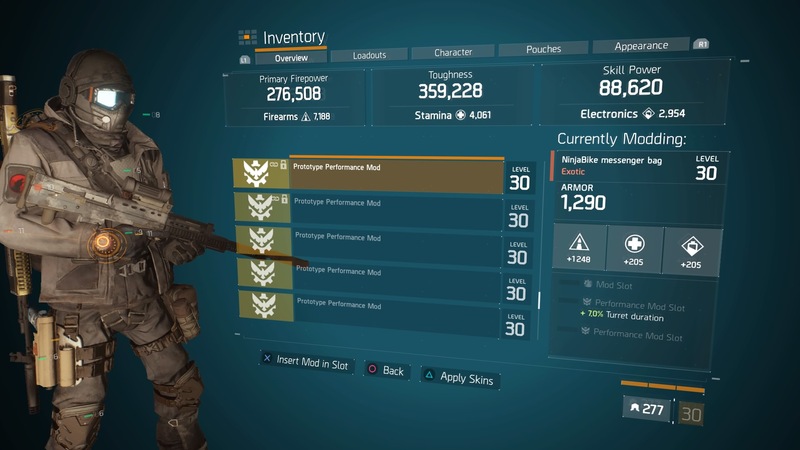 Part 3 will discuss weapons in The Division and how weapon perks work.